At KOHLER Original Recipe Chocolates we go to great lengths to ensure our customers receive the freshest product in the best possible condition. Our first priority is maximizing freshness and minimizing damage. This is why we exclusively ship our products via FedEx from our kitchen in Kohler. We ship throughout the United States, Canada and Europe. Orders from Alaska and Hawaii, or anywhere else outside the continental United States, require priority overnight insulated shipment. International orders are subject to applicable duties and taxes, paid for by the original purchaser. Please review your shipping information and preferred delivery date before submitting your order. Please allow 48 hours before pickup or shipment of orders. We guarantee to deliver fresh, delicious chocolates. If your order does not meet your expectations, please contact us immediately and we will do everything possible to ensure you are satisfied. Store chocolates in a cool, dry place between 60-70 degrees Fahrenheit. Humidity should be within 45-55%. Please allow up to 48 hours for pick up orders. For pick up orders placed after 4pm please allow 48 hours from the next business day. No orders are shipped Friday and Saturday to avoid product sitting over the weekend. Orders placed after 12 noon on Wednesday (except to destinations inside of Wisconsin and the Chicago area) will usually be shipped the following Monday. If we’re not confident your chocolate will be delivered by the weekend, we may hold it until Monday rather than risk a damaged product. Packages are shipped without a required signature. When sending gifts to a warm location, please notify the recipient when to expect the delivery to reduce the risk of melting. Please provide any special delivery instructions at the time of order. If the order is a gift, please include a message that will be included on the gift enclosure. Our trained staff chooses the method of delivery that is the best for your chocolates to arrive on time and in the best condition. The product will begin to melt at 70 degrees. KOHLER Original Recipe Chocolates is not responsible for melted chocolate; however, it’s our utmost priority to ensure your delivery is successful. In certain instances, we may contact you to upgrade to 2nd Day Air or Next Day Air shipping if the delivery location is projected to have a temperature above 70 degrees. We are not responsible for missing, stolen or damaged packages after they are delivered to the address specified by the customer or for orders returned or delayed due to incorrect or undeliverable addresses. All orders between April 1 and September 30 are packed in ice to ensure the quality of chocolates shipped to destinations warmer than 70 degrees. Without selecting “ship with ice and insulation” we cannot prevent melted chocolates. Please check the weather conditions for delivery location to help you determine what shipping method is best and if ice will be needed. Destinations outside of Wisconsin and the Chicago area will not have the option for ground shipment during this time. In the event that you choose not to use a cold pack in such conditions — or if you choose not to ship Fed Ex Two-Day or Next Day to warm weather locations — then, regrettably, your order will be sent at your risk without our guarantee. 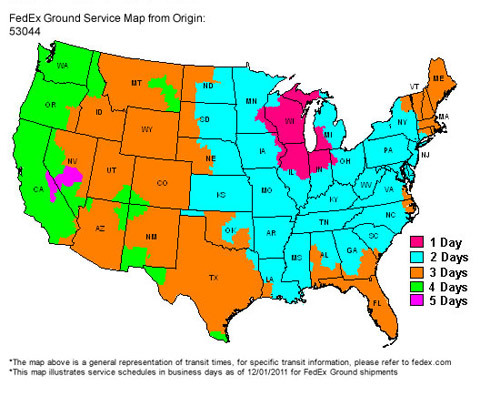 * This map is a general representation of transit times, for specific transit information, please refer to fedex.com. Call 800.778.5591 for rates on all international shipments prior to placing order. Call 800.778.5591 for shipping rates on all orders exceeding $400 prior to placing order.